Recipes of kibinai | KIBINAI – national heritage. No freezing. Kibinai are cooked and baked immediately. Free delivery in Vilnius and Trakai for kibinai sets CITY OFFER 10 + 30, KINDER CITY and FAMILY BOX. Tel. 869061010 (info@kibinaitrakuose.lt, www.trakukibinai.lt). Just special kibinai. You will praise us certainly. You prepare a feast, you want to test yourself in the kitchen or just to have a nice meal and treat your guests? For dough you need: Take 500 grams of the highest quality flour, add a pinch of salt (teaspoon is enough), take 250 grams of good quality butter (fat content at least 78 per cent), 200 g of sour cream (40 per cent fat content), take 2 large eggs, domestic fowl is the best. How to cook the stuffing? For chicken filling you need: Take 600 g of chicken fillet and chop it with a knife or a simpler version, just take the chicken leg meat mince (preferably the large mill). Take 2 large homemade onions, 1 large tablespoon of butter, add 125 ml of water or naturally cooked chicken broth, you can add natural spices, Provencal herbs, chopped sea cabbage according to the taste, or just one-third-fourth of the organic ecological chicken vegetable or mushroom broth according to the taste. Of course, do not forget a pinch of salt, add 2 tablespoons of sour cream and freshly ground black pepper or pepper mixture, preferably ground directly from the mill. Do not forget that while baking kibinai, you need to take care of its backs, it should have nicely yellow and brown color, it it required just one egg and a dash of water. Kibinai with chicken (manufacturing and baking process of kibinai). 1. After all, pour salt into the flour and mix well. Cut the butter into small pieces (you can grate). Mix the butter and the flour until the residues of butter will disappear. 2. In the middle of flour and butter mixture, just make the hole. Sour cream and eggs mix well and pour into your prepared hole. Mix it well and thoroughly, in order to cook very tasty kibinai, do not be lazy and work. 3. Compress in hands the dough until dry flour will disappear as you need to form a ball of dough. You should knead it at least a couple of times. 4. The dough should be chilled, so at least for 30-40 minutes take to refrigerator or in winter take to the balcony, porch or other cool place, it is clear that before it tightly enclose. 5. When dough is getting cool, prepare the filling, take the onions and cut into small cubes. Approximately 2/4 of onions fry, the best and the tastiest way is to use the molten butter or just butter, coconut oil, and for the rest of the onions, take it not crisp to the meat, you can put onions according to the taste more or less, if you like, the more onion, the less meat or other filling. Mix the meat with your prepared fried onion broth and sour cream, as well as add the pinch of sea salt or a simple or Himalayan salt, according to the taste ground black and white pepper or pepper mixture, preferably directly from the mill, because then the pepper taste is quite another. Of course, you can use the already ground pepper, if you do not have a grinder, and let at least 30-40 minutes to stay. 6. Divide the cool dough into equal-sized pieces, having such an amount you should get 30-40 pieces of dough, take a hard surface, preferably, board sprinkled with flour and roll out on a floury surface to get a more rounded shape. 7. On the rolled out surface place 1-2 already prepared the filling and then carefully squeeze the dough, it should wrap and hide the stuffing, its edges roll up. 8. You need to bake kibinai 30-35 minutes at 190°C temperature until it will roast nicely. If you bake in a simple oven, it is also necessary before baking to beat the eggs with a little water. Place kibinai on a parchment-lined pans (baking sheet), coat the kibinai with the beaten egg, for coating it is better to use a brush. There are many recipes of kibinai preparation. Here some of them. 1. We cook dough: we need butter or margarine to rub on a grater and to mix with 350 g of flour, to knead to a friable state. 2. In a bowl to shake up eggs with sugar and salt and to add sour cream. 3. We gain mix, which needs to be poured out in the received friable mass. 4. 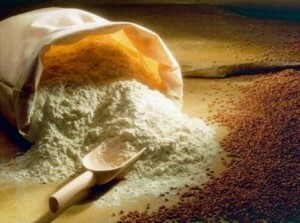 Then it is necessary to mix elastic, soft dough. If it is necessary, add more flour (50 g). 5. To put dough in the refrigerator for 30 min. 6. To prepare a stuffing: to cut onions (as for forcemeat) and to crush garlic. 7. To mix meat (forcemeat) with onions and garlic. To add salt, pepper. 8. To mold pies: to tear off a slice of dough and to roll in a circle. To add a stuffing and to pinch edges, to create a braid. 9. To grease pies with egg. To put in the oven warmed to 200 °C and to bake for 30-40 minutes until pies will be beautifully reddened. If you have no mutton or beef, nothing is terrible. Pies can be cooked and with pork. It is the best of all to chop meat, because it turns out more tasty, but it is possible to prepare and with forcemeat of coarse grinding, it turns out very tasty too. It is possible to add 100 ml of kefir to a stuffing also, it will be juicier. To sift flour. To rub butter on a grater or to cut into cubes and to throw into flour. To salt. It is also possible to use margarine, then it isn’t necessary to add salt. It is necessary to mix butter with flour by hands. To add sour cream and eggs to the received mass. To mix dough by hands. Dough has to feel love and heat of hands. To create by hands a sphere and to put in the refrigerator for half an hour. While dough is cooled in the refrigerator, to prepare a stuffing. Meat needs to be cut into small cubes. It is possible also to grind in the meat grinder. To add chopped onions and salt, to add a small amount of black ground pepper. Other spices it isn’t necessary to add. It is also possible to add water because the stuffing has to be very juicy. Then to create pies. For one kibinai you need about 70-100 g of dough. It is necessary to roll a circle from dough, and in the center a stuffing has to be. To pinch edges (edges have to be quite wide) and to create a braid. It is necessary to put kibinai on baking sheet, covered by baking paper at distance from each other. Kibinai will increase in volume. To grease with egg. Using scissors to cut through two small holes, then dough will not burst and juice will not flow out. To put in 200°C an oven for 20-30 minutes. Kibinai turns out juicy inside, because even dough becomes impregnated with very delicious juice of meat. During eating it is necessary to be careful in order not to burn yourself with juice. You can serve with broth or separately. It is necessary to add butter to the oversown flour and to rumple it, to add sour cream, the shaken-up eggs and a little salt. Then to knead dough and to put it for 2 hours in the refrigerator. To cut meat into cubes and to cut a bulb into small slices, to add salt, pepper and a few tablespoons of water. To divide dough into 20 parts, from everyone to make a flat cake, in the center to place a spoon of a stuffing and to create pie, to clamp edges. To lay out on the baking sheet, which is previously oiled and to bake for 25 minutes in well warmed oven. Forcemeat needs to be mixed with onions, then to add salt, pepper, sugar and water. Carefully to mix everything. From the listed products to knead dough, to roll it, and then to cut into small squares. On each small square from dough to put small slices of forcemeat, to pinch edges carefully, to create pies. To lay pies on the baking sheet, greased with oil, to grease them with a yolk and to bake to readiness. For preparation of dough it is necessary to mix butter, sour cream and flour. It is necessary to knead dough until it will not stick to hands. In order to make dough good to roll, it needs to be put in the refrigerator. In order to make the stuffing gentle and juicy, it is necessary to wash out meat and to wipe it with a napkin. Then meat needs to be cut into small slices, to add small cut onions to chopped forcemeat and to mix with greens and seasonings. Then the cooled dough needs to be rolled in a sausage and to cut into equal pieces (about 24 pieces). Then to roll dough and to put a stuffing on the middle. Edges of dough need to be connected and pinched. Put kibinai, previously greased with a yolk, in the oven, warmed to 185 degrees. Preparation time – 30-40 minutes in an oven and you can enjoy these the most delicious pies with a juicy stuffing in the friable, crackling dough. 300 g chicken, 1 onion, 1 carrot, celery, parsley or parsnip, dill, 2 bay leaves, black pepper, salt to taste, 2 l of water. Remove the feathers and internal organs and thoroughly wash the chicken in cold water. Cut off fat from chicken. Carrots can be not cut and can be cut into figūrines. Add water and put chicken in water, cook and remove foam. Put onions, carrots, celery, parsley or parsnips, salt, spices in a chicken broth. Cook chicken broth for 40-50 minutes with a lid open or without it. At the end of cooking add parsley and dill. Prepare chicken broth for filtering. If you prefer, you can add carrots and greens. Chicken broth can be taken as a separate dish or with kibinai. Chicken broth is kept in the refrigerator for 4-5 days. On the basis of chicken broth soup or sauce can be cooked.